There is a paradigm shift to web based applications as a general business model, and running a successful practice is essentially running a business. AvaDent Digital Education Solutions formerly My Dental Hub has been first to market in the comprehensive web based patient education space and has established itself as the leader for online patient education. AvaDent Digital Education Solutions formerly My Dental Hub was founded in 2008 when it became evident that web-based programs were the way of the future. The software has been growing constantly over the years. After some preliminary practice, it has been found that educated and informed patients make better decisions and are more involved in their treatment process as a whole. This led to the creation of software that is available to everyone. 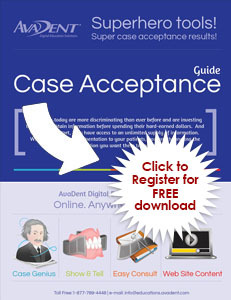 AvaDent Digital Education Solutions formerly My Dental Hub thrives in the changing landscape of the dental industry. Constantly changing, adapting, and working to create the ultimate practice marketing and sales tool is what we do on a daily basis. I’d like to receive patient education tips & news. Your email address is never shared, rented, or sold. An unsubscribe link is provided in each email.